Fais attention à ton sac! That was one of the first tidbits of advice from a non-Parisian French friend prior to my move to Paris: beware of pickpockets. In my first months here the imprint of my pocketbook made a permanent crease on the skin of my inner elbow, so tightly did I squeeze the precious bag each time I ventured onto the streets. Maybe nobody likes me, or maybe I don't look like an apt target, or maybe I'm lucky. In a year and a half in Paris, I've been begged at, I've been scammed by gypsies, but not p**kpock**ed. (I'm too superstitious to say it.) Maybe Paris' petty-thievery reputation is overblown. The only time I've had to foil an attempted purse-snatching was in broad daylight in Brussels. Don't ask. Here is what happens most frequently: if I am leaving a shop and haven't yet zipped or buckled my purse post-purchase, the store owner thoughtfully reprimands, "N'oubliez pas de fermer votre sac, Madame." I have overheard total strangers dole out this advice to forgetful fellow passengers on the metro as well. On Bastille Day morning, when at the Champs Elysées to do some scoop reporting for this here blog, I crossed the broad expanse of cobblestones on avenue Winston Churchill, snapping behind-the-scenes pre-parade shots with my digital camera. A police officer at the barricade beckoned to me. "Madame, votre appareil!" he warned. Uh-oh. I'm in trouble now, I worried. Something I'm not supposed to be taking pictures of, some French photojournalistic rule I'm unaware of. The avuncular gendarme smiled as I approached. "S'il vous plait, put your hand through the camera strap. C'est dommage, but in large crowds like this there are des personnes malintentionnées who will try to steal it from you." I obeyed like a well-trained spaniel. He was so kind. I felt so protected. Sigh. See why I love Paris? A little knowledge is a dangerous thing. Especially when living in a country where you think you know the language. And especially when you think you know the local argot. Ensconced in the beautician's chair, listening as my cheery young coiffeuse regales me with stories of her sleep-deprived evening, initially I am mildly taken aback. I am not so sure that I want a woman who is functioning on double-espressos and three hours' sleep to be making major decisions about the length and long-term sculptural quality of my hair. But I can live with that. Valerie is so talented. Lithe and exposing just a hint of tattoo on her flat midrift (which is right at my eye level), she prances around the swivel chair, laughing as she launches in on the reasons for her lack of sleep. "My husband and I got home from a dinner at midnight and started to papoter, papoter papoter, and the next thing we knew it was 5 am and we hadn't had a wink of sleep." Then I scrape the recesses of my "I've- heard-this-somewhere" contextual language memory and come up with a similar sounding word, but I think it means, er, to caress erotically. I nod and chuckle amicalement. She is a bit of a wild character, that Valerie, but I love her. Always le bon mot. The stand-up comic of the salon. But would she really be confiding in me that she and her husband were in the midst of conjugal groping all night and that's why she's so exhausted? I wonder, I fret, I ignore, I give a little Americo-Gallic shrug and keep smiling. Haircut gloriously finished, generous tip to Valerie plunked down, I wend my way home. I head straight to the bookshelf to look up the answer in Le Petit Robert. Whew. Papoter means to chat. They were up gabbing all night! Tapoter means to tap. Se tripoter means...yeah, that. I just got back from the Tour de France finale on the Champs Elysées. I didn't see a thing. Well, nothing except T-shirt booths, massive crowds of eager viewers eating saucisses from the snack stands and trying on their new Tour de France T-shirts. American high-school girls flirting with French policemen, the teacher chaperone looking on assuming it was a good language learning experience. Kids on their fathers' shoulders waving large green sponge hands. The sidewalks were so packed I could barely see the barricades. All I needed was a "please pickpocket me" sign taped to my back, and the scene would have been perfect. Sorry, I'm not a crowd person. So I strolled back home to watch the exciting finish on TV. From the Invalides I walked over to rue de Bourgogne. Utter silence. It was as if a neutron bomb had gone off in the 7e arrondissement: not a soul on the sidewalks, not a car in motion. Down rue Barbet de Jouy. Ditto. The only occasional noise was the muffled sound of silverware clinking against china, wafting from open windows. Virtually any Parisian who didn't leave town Friday or Saturday for vacation was eating Sunday lunch with la famille, and/or waiting to watch the final 100 kilometers on la télé. Or maybe at the Champs Elysées, but I doubt it. Paris is emptying out for August. In the cheerful bookshop on rue St. Dominique, the narrow aisles were abuzz with departing vacationers looking for summer reading. The affable owner alternately greeted, rang up sales, and squeezed through the convivial clusters of her browsing guests. On the tables in center of the main room, her pride and joy: orderly piles of books that she has read and likes. The top book of each stack sported a handwritten post-it note with her personal recommendation. "I never read reviews," she beamed. "It must be a book that reaches my soul." Darting through the crowd, she accompanied customers to this spot or that, pointing out books that she thought they'd enjoy. "Here, monsieur, this one is a touching love story," she suggested to one ruggedly handsome fellow. "Ah, excellent," he nodded appreciatively. Then a pause. "But, then one wants a love like that in real life," he sighed. "It doesn't always turn out so well." 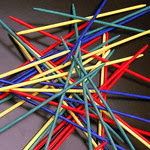 There is Mikado, the French version of the classic game of pick-up sticks. And then there are Mikado. The yummiest skinniest chocolate-dipped cookie sticks, which I have grown rawther fond of. If you are new to Mikado, think of a chocolate covered pretzel, untie it, take away the salt and straighten the twist. And make the chocolate darn good for something you find in the grocery store aisles. Then imagine it about three times better than that. Good, you've got a Mikado. After dinner, who needs a filling dessert when you can have -- oh let's say -- three or four Mikados? At 11 calories apiece, it's all you need and they really hit the spot. Maybe this is how French women "don't get fat.."
Sweet tooth crying out in the mid-afternoon? Yup. A café and a Mikado or two. Perfect. In my inimitable way I assumed that I had made a brilliant "secret'" discovery of these, but it turns out there's already a highly populated Mikado fan club. The Lu Company should pay me for all the promoting I do for them. 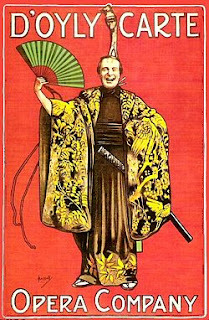 I sing high praises of Mikado from the mountaintops of Paris. Oh, but Mikado already has a witty ad campaign. Hey, but it's no fair for people who don't live in France who can't buy them, right? Mais pas du tout! In a Mikado-induced frenzy, I stumbled upon an American French-food-lover's dream come true. French Feast is a NewYork-based shipper/purveyor of all-time favorites in French foods, from foie gras to Hollywood chewing gum. Madeleines, morels, moutarde, miel, marrons glacés -- well, you name it, they've got it. Remember all those foodstuffs you've stuffed into your suitcase before departing for your flight from Charles de Gaulle back to the U.S.? No need to anymore. French Feast ships anywhere in the U.S. for a flat $8 rate. Except you'll have to wait a bit for your Mikados. They don't ship chocolate in the summer. From my first "Polly-vous francais" moment as a child to current French friends, I've been blessed to know patient people who teach me a great deal about practical French, languages, systems and cultural codes. One mentor who had an enduring influence on me is Mamita. I met Mamita the summer before college when I first set foot in France. Spending July and August with an extended Parisian family who were friends of friends of friends, officially I was an "au pair" in the old-fashioned sense. It was not a paid job at all; rather, I was part of an adopted host family for the summer. The family consisted of a widowed great-grandmother, Loma, less than five feet tall and clad head to toe in black; the grandparents, Mamita and Dady, a welcoming, erudite couple retired from UNESCO and international affairs. Their three daughters, Martine, Chu, and Domino, were svelte and gorgeous twenty-something sisters, the elder two accompanied by dashing husbands and towheaded toddlers. My role was to be the "extra" youngest sister, helping out where needed, an integral part of the family in the French hierarchical sense. I arrived on July 14, an auspicious date, a turning point in my life. Their summer house was a rustic but exquisitely renovated stone compound --a former sheep farm on Ile de Ré, off the Atlantic Coast. This was Ile de Ré before the bridge, before movie stars and le Tout Paris. Ile de Ré where summer days were spent picnicking in the shade of the pines on the beach at Trousse Chemise. Evenings dancing at boites de nuit with the young couples after the children were tucked in bed and the grandparents read by the fireplace. I spent six weeks in the heart of this family, not speaking a word of English. Usually I spent mornings back at the house with Mamita, a bright, energetic woman in her 60s, helping her with les petites while the young mothers escaped for a game of tennis or errands. Mamita showed me how to select perfectly ripe plums and mirabelles from the fruit trees in the garden. I learned how to make jam. I observed Mamita as she trained her three cherubic granddaughters in all the proper ways of being good little French girls, bien elevées. Mamita knew how to speak perfect Oxford English, but since I was there to absorb French language and culture, she genteelly refrained from uttering a word of English all summer. While the little ones were napping and she and I had a break, we would retreat to the shade of the garden and play French scrabble -- and oh, how gracious she was. We took Scrabble to the beach, too, and Mamita kept the tiles in an old purple velvet Seagram's drawstring bag -- such an elegant touch and yet so frugal. She never actually let me win a game, but she gave ample hints, her eyes sparkling with delight if I made a good play. Mamita specialized in the art of hints. Since that summer I was an American teenager and it was the 1970s, I was naturally inclined to run around barefoot. Long hair and a flowing India print dress were my uniform. Island weather was hot and sunny, and the transition from house to courtyard to yard seemed seamless to me. 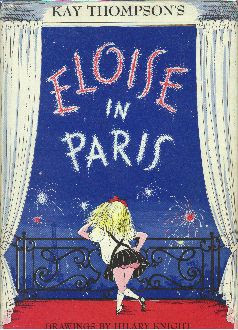 One August day, Mamita asked me with a wise, warm smile, "Polly, tu n'as pas froid aux pieds?" ("Aren't your feet cold?") "Non," I replied merrily. "Ca va!" The next day was another scorcher. Again barefoot, I lolled around the house and terrasse. Mamita, once again, "Dis, Polly, tu n'as pas froid aux pieds?" Again I blithely replied that no, I was accustomed to the.... oh. Ohh. Cultural light bulb popped. Mamita, in her elegant, kind manner, was letting me know that it would be better if I wore shoes. Without another word, I slipped on a pair of espadrilles and wore them daily for the rest of the summer. My French summer was filled with subtle epiphanies like that -- not just that French people from "nice" families disapproved of grown young women going barefoot, but also that she would never have affronted me by complaining or directly instructing me to don shoes. Lessons in nuance that can't be taught, but can be gleaned if you just pay careful attention. Mamita taught me by inference, to listen, observe, to be a jeune fille bien elevée. Following Mamita's gentle lead, I learned more about being French than any textbook or etiquette class could have dreamt of drilling into me. The memories stayed with me, and have been recalled fondly with her when I've had the chance to visit Mamita over the years. She continued to be so gracious and hospitable to visitors, though frail and having difficulty finding her breath to speak. Yesterday evening in her beloved stone house on Ile de Ré, Mamita died, just before bedtime. She would have been 95 this November. One day last summer I was in the car with my friend Marie Noelle, returning from a morning spree at IKEA. We were stuck in midday peripherique traffic and I needed to phone to cancel a 1:30 appointment, but I didn't have the number. "How do I dial Information?" I asked. She wasn't sure; it had changed. Something about there being one number to call from a portable, one from a ligne fixe. So she called home to ask her 20-year-old son how to call les renseignements. He had no clue. Next, while deftly shifting gears and flicking cigarette ashes out the window, she called her sister in Aix-en-Provence. Still no clue. Whoa. We were phoning the other side of France to find out how to dial Information. From the highway. And came up with No Answer. How's that for technological irony? It was "stump the chumps" time. We didn't get the number that day. I never did cancel the appointment. Instead, I had to call from home the next day and lie, lie, lie. I now have 118 008 programmed into speed-dial. Labels: French traditions, media, where am I? It just wouldn't be a weekend in Brittany without friends and mussels. Les amis. Les moules. A winning combo. Walk to marché down the street for ingredients. Check out rainbow on grey cloudy horizon. Sauté chopped shallots in life-altering-palate-inspiring local butter from la crèmerie, toss in some Muscadet, add mussels fresh from the fishmonger at the market. Stir. Remuer. When the shells are open, add a carton of crème fraiche. Stir again. Open another bottle of Muscadet. Over the weekend I rode the TGV to and from Brittany. I have no witty vignettes of fellow passengers to relate. No stories of missed connections or bucolic countryside as it blurred past the train window. Unaware of my surroundings, I travelled to another place during the three-hour ride each way. 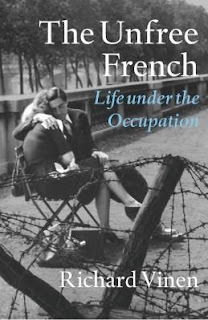 I journeyed through France in the early 1940s, immersed in reading The Unfree French: Life under the Occupation by Richard Vinen. The Unfree French is a densely written, engrossing study of everyday life in France from May 1940 until the Liberation of Paris in August 1944. To describe this book as a mere eye-opener is understatement. From the exode, when millions of panicked families fled to the countryside, to the Service de Travail Obligatoire (STO) when French civilians were sent to Germany to work, the book traces a complex history of the lives of "...human beings [who] struggle to survive by any method." Page after page of intense historical information peppered with astonishing anecdotes. Think about this: today, virtually any French person over the age of 65 has a memory of Occupied France. These are people you encounter daily. I've long had an unquenchable desire to know more about this era, about the lives of real people whom I've met and how they might have lived. There's no one simplified story to tell. The Unfree French brings it all to life. Then, on page 110, one of the most amazing tales, albeit not about an everyday individual: Adolf Hitler (bold-face emphasis is mine). "Paris was ..used as a centre of recreation for German troops who were brought to the city under the 'Jeder einmal nach Paris' (everyone to Paris once) programme, which subjected them to a brief tourist visit that included standard attractions (a ride on a bateau-mouche, climbing the Eiffel Tower). Hitler himself had set the tone of such visits when, on June 23, 1940, he spent two and a half hours in Paris (the only visit of his life). He arrived at Le Bourget Airport at five in the morning, accompanied by Albert Speer and the sculptor Arno Brecker; he hoped that the visit would provide ideas about how German cities might be rebuilt on a grander scale. He began by visiting the Opera at six in the morning before moving on to the Arc de Triomphe. He saw the Place de la Concorde.... The tour finished with a visit to the Sacre Coeur, and Hitler flew out of Le Bourget at half past eight the same morning. Hitler did not speak to a French person during his visit and indeed saw almost no one except a few policemen and a terrified concierge at the Opera who refused to take a tip from Speer." I'm not sure why I'm so flabbergasted at this story. That, for all the years of Nazi occupation of Paris, Hitler spent less time here than any other tourist known to mankind? Or was it the sheer speed in which his whirlwind visit was able to be accomplished? Or that I naively hadn't known this before? I found the account disturbing. But The Unfree French is more than stories of Hitler or the Nazis, or of Vichy, Petain or Laval. It is gripping social history of real people of all classes and how they coped or collapsed under the desperate years of the Occupation. Unsettling, enlightening, but fascinating at every page. Today, anyone walking through the streets of Paris can sense its history -- reaching much further back than the Occupation -- echoing from every stone. But reading The Unfree French helps you understand the more recent history of a current generation. It is a history that still lives, etched in the faces and comportments of its inhabitants. The Abbey Bookshop is not a place for the claustrophobic. Nor is it a shop for giraffe-like book-lovers. More importantly, for those (like me) blessed with permanent ADD, this shop is an absolute focusing nightmare. There are so many places in Paris I have been meaning to stop in, having read about in one guidebook or another. But yesterday, after stumbling out of the Eglise St. Severin, I literally stumbled upon the Abbey Bookshop. The very kind and not-at-all-unhandsome Canadian owner offered me a coffee, and returned to festooning the store for tonight's Harry Potter party, launching the umpteenth book of now billionairess J.K. Rowling. Brian (?) the owner, assured me that J.K. would be on hand for the party, only she would be wearing her invisible cloak. There will also be a host of sorcerers and other gobbledygook HP characters. Let me confess. I am not Wild About Harry. I am certainly very happy for the throngs of HP fanatics worldwide, but I just don't happen to be one of them. When the first Harry Potter book was published, I read a few pages, and secretly found it to be patronizing and inane. But I forced myself to be cheerful when reading it aloud to my then-school-age offspring. Finally, at around page 40, my daughter begged most politely, "Mom...can we read something else?" I never picked up a Harry Potter tome again. Trying to remain au courant, nevertheless, I took my kids to the first HP movie. I fell asleep and I gather they fidgeted throughout. Not a hit. So whenever HP mania struck town in one form or another -- lest I get stoned by angry villagers for my HP heresy -- I simply smiled benignly with an unemphatic "Great!" when they regaled me with the Boy's latest antics at Hogwarts. A special art, learning to under-exclaim diplomatically. Oh wait, I was talking about the Abbey Bookshop. The ADD kicks in from time to time. Mes apologies. On paper, the Abbey Bookshop might seem to be a place I should avoid, but in fact I am mesmerized by it. It oozes literature and genuine charm, HP notwithstanding. It smells like books. It's got an authentic book-love aura that clings to your trousers when you exit. Rows and rows of books, sliding shelves of floor-to-ceiling hardbacks, paperbacks, best sellers and long-forgotten classics. No attitude. Steep, narrow stairs, littered with fallen books, lead to the ancient stone vaulted-ceiling basement, crammed with -- more books, of course. A bibliophile's dream come true. Wait, it's only 11:30 pm. I still have time to head over to their Harry Potter Party, tonight from 10 pm to 1:30 am. 48 hours. Not much -- two days. But when France Telecom tells you that you have a probleme de reseau (network) and it will take up to 48 hours to repair your internet connection, the cyber void looms like a cloud. How can I cope? I tried to find the free wifi in parks promised by the Mairie de Paris, but nothing in my neck of the 7e arrondissement. Yet. So I find myself sitting in the Cafe Jav -- un bistro Wifi -- on rue de Sevres, feverishly checking and answering emails for the two hours that my laptop battery lasts. It's a new experience for me, sitting here with as late-morning cafe-creme as the day merges into to lunch time. The habitues arrive at noon, always entering the cafe with a bonjour and a handshake for the bartender and other customers. The bartender offers them their regular apero-- un Calva, un ballon de rouge, un Coca, une demie pression. Carpenters and businessmen and postal employees chatting at the counter, an elderly lady in a wheelchair with her companion at a sidewalk table. Adolescent couples demeurely sequestered in the corner. Three bearded men about my age, in tweed jackets, grouped around a table checking out the babes parading by on the sidewalk in their lightweight summer outfits. After pontificating on the morning's events, the buddies at the counter swig the last of their drinks and depart with the understanding they they don't pay. I wonder if they have a tab or if the drinks are on the house. More customers arrive to replace them, sharing sections of l'Equipe, the sports newspaper, for lack of a listener. More local news, more gossip which I don't catch the gist of. One guy on a stool announces to the group "je suis amoureux." I order lunch, a tartine Norvegienne. An australian man slides into the table next to mine and asks in French if there is Wifi here. His internet is down too. The young American couple across from me asks where to find Vegan restaurants in Paris. I'm stumped, but recommend Lebanese or Sri Lankan places. The buzz of camaraderie is contagious. I am lounging in my seat, sipping my after-lunch cafe. The floor-to-ceiling windows are open on two sides, a breeze flows through the room. summertime, in a cafe, in Paris. Now there is salsa music playing. I linger. Oh, maybe France Telecom will fix that internet connection at home. I don't care so much any more. Serrurerie. A locksmith's shop. I pass it every day. I can say the word locksmith just fine...in English, that is. En francais, I'm fluent enough that I can even pronounce the word serrure ("lock") using my hard-earned correct French r. But to say serrurerie? Forget it. It is not happening. It requires too many mellifluous, throaty French r's in too short a time frame. I practice pronouncing it smoothly. Serru-re-rie. To no avail: every time I try, I find that I've barely recuperated from rolling out the first r when the next r and the next r need to come flying out of my tonsils. I discover this dilemma when innocently asking my proprietaire if there is a locksmith who can make a copy of a key. "Madame, est-ce qu'il y a une serruheuh-hlerie...," I end up gargling, the pitch of my voice sliding from its habitual soprano to a gutteral baritone in the space of five words. Apparently I am not alone in this; many Anglophones with decades of practice in phonetics classes, language labs, and even living extensively in France, have triumphantly mastered the French r, but their exhausted epiglottis just comes to a dead halt on serrurerie. Conquering just one French r, of course, is the bête noire of French majors and their long-suffering professors -- so learning to say it three times in rapid succession is the Final Frontier. I am not even near the edge. A while ago, when I was a French teacher, I remember trying to train my students to pronounce the French r, using a clever method I'd just read about in a language journal. It went something like this. First say, a-ab. Repeat that several times. A--AB ... A-AB... A-AB. Then a-hab. A--HAB, A-HAB, A-HAB. Then while your throat is thus warmed up and newly phlegm-free, you take the plunge. You cough out, a-hrab. A--HRAB... A-HRAB... A-HRAB. In theory, with time, the r should be forthcoming. Nice idea, but it was a total flop in my class of 8th-graders. "But Mrs. L," they insisted, "like, why are you trying to get us to say, like, Arab?" It was futile. I made no more Henry-Higginsesque efforts in French elocution. My own acquisition of the "proper" French r came quite by surprise. The summer before entering college, I was an au pair in France, and one of my young charges was named Corinne. I stumbled along for the first month of vacation calling her something that vaguely resembled Co-heen. Then one August evening I was calling her à table, and I yodelled, "Corrrrine!" Out flew that French r like a lark rising to the treetops. Startled, pleased... thrilled, I wandered around the garden repeating "Corinne, Corinne, Corinne," like a singsong lunatic, afraid that the this had been a one-shot deal. But it stuck with me, that French r. At dinner that night, no one else in the French family noticed that suddenly, magically, I had IT! It was my happy secret, like losing my no-French-r virginity. In an instant, I had become a different person. But that summer I had no need of a locksmith. In all the years of subsequent French speaking, reading, and writing, I never found the need to croak out the word serrurerie. But if you live in Paris and you have keys, chances are that someday you will have to face the serrurerie-pronunciation beast. You must do so at your own risk. If you insert three plain-ruh-ruh American r's in the word, you sound like Lucy drunk on Vitameatavegamin: suh-roo-roo-ree. Try to trill it correctly with the French r and your poor uvula gets chafed with a bad case of friction burn (diction burn?). Here, take the keys. Go ahead and give serrurerie a try. Then spritz a little Chloraseptic and call me in the morning. Stretch your arms out wide, and you are measuring a distance of about five to six feet. Shrink them in a smidge, and you're at four feet. Four feet is either plenty wide or very narrow. In Paris, there are a variety of things to see that are about four feet in width. A classic French door mat. Gee, I don't know who keeps claiming that Parisians aren't friendly. Why, just this very afternoon, there I was, just looking at my guide book, trying to find the covered passages it recommended. I was aimlessly strolling down rue St. Denis in the 2e arrondissement. And whaddaya know? All along one block there were dozens and dozens of gals, you know, just hanging out, trying to make friends. On their front stoops. Dressed up so special, too. They didn't really seem to be chatting with each other much, though. But, golly, they were just as friendly as can be to strangers passing by!! 'Specially to the guys. Then, these two neighbors were having quite a heated conversation, until this gent walked by. The lady on the left was wearing lamé-and-leopard business attire. Poor thing must have gotten so hot in the sun earlier, 'cause it looked as though she'd taken off most of the rest of the outfit. I apologize -- this photo was taken in a hurry because I didn't think it was a good idea for me to stop in a doorway to snap a photo. Not that there were many unoccupied doorways. Gosh! Such outgoing people in this neighborhood! I was awakened at 5:15 this morning by the only mosquito in the 7th arrondissement. It entered my bedroom window to persecute me, taunting, "Madame, in Paris we don't leave our windows open at night." Actually, I think it was still on a buzz from one of the bals polpulaires hosted last night at various casernes of the Pompiers de Paris until the wee hours. I wreaked my revenge, and suffice it to say that darling moustique will not be darting over the Champs Elysées today to view the annual 14 juillet parade. Resigned to being wide awake, I decided to head over to the Champs myself to catch a glimpse of the preparations before the crowds arrived. I emerged from the métro at Champs-Elysées - Clemenceau at 6:45, and to my surprise crowds were already standing at the barriers to save their spots for viewing the parade. Military marching music was pumping out of loudspeakers mounted on streetlamps, and the police covered every street corner, most of them relaxing a bit before the real work begins. Paris really puts on a parade! There are deep rows of viewing seats -- the gendarme said they were places reservées (though he didn't specify for whom) -- lining the street from the Grand Palais to the Place de la Concorde. And, of course, the grand presidential viewing stand in the center. It was interesting to note the behind-the-scenes aesthetics. TV camera stations (or security look-outs?) were draped with camouflage fabric to make them as unobtrusive as possible. I'm not a fan of huge throngs -- and today's turnout is predicted to be larger than usual. Wandering off, I strolled over the Pont de La Concorde to head home. The Seine, so often a turbulent grey, was angelic, dressed in its finest for Bastille Day. Mosquito or no mosquito, I'll have to remember to get up early more often, now that summer is here. Walking around Paris, I often wonder about what gives me that comforting sense of famliarity, of feeling at home. I realized that in part it comes from fond memories of great classic children's books. These were (are) my favorites. I can still recite most of Madeline by heart. At the Pavillon de l'Arsenal tonight the judges announced the winning design for the Concours International pour la Renovation des Halles. The laureats were Patrick Berger & Jacques Anziutti. The ten top entries were on display. The Pavillon is the Centre d'information, de documentation et d'exposition d'urbanisme et d'architecture for the City of Paris. A good place to visit if you are even vaguely interested in the urban planning in Paris' neighborhoods. Plus there are some great architectural maquettes on display. While many of the video presentations were quite striking in their graphic design, I found that they flashed images so quickly it was hard to get a grip on the actual plan. Nevertheless, an intriguing exhibit center. Quirky, fun boutique. This afternoon at a spiffy station just off rue de Rennes, two cheerful Velib staffers were on hand to explain the system to curious passersby. Curious is my middle name, so I stopped for a chat. Velib, of course, is the much-touted new "free" bicycle rental program putting thousands of bikes on the streets of Paris. Here is the scoop. Sit down, put up your feet. First, the bicycles are sturdy and attractive; and while I wouldn't go so far as to call them beautiful, it is a case of function defining a pleasing form. Except for their weight, they seem to be eminently practical bikes. Baskets, lights, locks, the whole package. In order to ride a Velib, you must be at least 14 years old. (No upper age limit. Whew!) Between 14 and 18 you must have parental (or equivalent) permission. To sign up for the one-year subscription (29 euros), you have to fill in a form and have your Velib carte mailed to you. 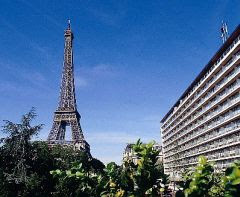 The form is available at http://www.velib.paris.fr/ and takes about 15 days. If you already own a Navigo pass, you can have the 29 euros charged to that and can swipe it as you would you Velib carte, at the electronic docking stations. In order to sign up for Velib for a one-week (5 euros) or one-day (1 euro) pass, you have to have a credit card. You get this pass at the "borne" -- a kind of tall freestanding ATM found at each station. I'm embarrassed to admit that I forgot to ask if foreign credit cards will work (the ones that are sans puce, without a little microchip). This could be critical. Enrollment requires a deposit of 150 euros, none of which is removed from your account unless you fail to return your Velib at the appropriate time. The borne will issue you a magnetic Velib Ticket which you swipe at the Velib electronic post (point d'attache) in order to unlock your bike. 4) get charged for the additional minutes. The additional minutes are the key part to this program. Better get that bike back on time! The point of the program, they explained, is for Velib to be an alternative to public transportation or walking. It is not "un velo a balade" -- not for leisurely day-long bike rides. That helped calm my concern about all the wonderful bike rental shops and bike tours in Paris which already do such a great job. The Velib has a small electronic dashboard which tells you the status of your available minutes. Kind of like being on the bicycle machine at the gym, but this time you're actually going somewhere. Since you won't be keeping your bike idle for very long, the lock system won't be that necessary. But it is practical. The temporary lock is permanently attached to the bike. So if you, for example, are just stopping by the boulangerie for a baguette, you simply flip down the kickstand (kind of like a motorcycle kickstand) and attach the lock around the nearest pole. The lock key is released once the lock is well attached. Don't lose the key! And you'll hope that the boulanger is speedy, because the minutes are ticking away one your dashboard minuterie. Next scenario. Your 30 minutes are up and you've duly arrived at the nearest Velib station to dock your bike. But wait -- the Velib station has no free space! What to do without getting nailed for the charge for the extra 1/2 hour? Aha! They have anticipated that. The all-knowing borne knows when its station is full, so you go up to it and in Oz-like fashion ask for mercy. It grants you a 15-minute reprieve and also tells you where the nearest empty Velib station is located. They didn't have any information in English, but siad there will be some on the website and perhaps at the big official launch on July 15. Meanwhile, there will be Velib helpers every day (except July 14) at various stations around town to explain the rules and how Velib works. Voila. Have I confused you enough? P.S. I asked the young staffers if the sporty Velib-logo Tshirts they were wearing would be for sale anywhere. "Euh..non, " they said with a grin. "In fact, we have to return them at the end of the day." One of my favorite US-based France blogs that I read without fail is the fabulous The French Journal. Not only does blogger Chris Late hail from Beantown, like me (all bloggatics is local? ), but he's always on top of the freshest news imaginable about France and the US. And presents it in user-friendly format. When I was in the States last month, Chris and I had a very merry time over a couple of cuppas at a cafe in Boston's Back Bay. Two hours have never flown by so fast. There we sat, alternating being preacher and choir, swapping dontcha-just-love-France stories faster than kids in a revolving door. "Did you know this francophile anecdote?" "Have you ever been to this place?" "Can you believe that so-and-so did such-and-such?" Nodding and laughing so much that it felt as though we'd know each other for years. I could have danced all night. Way too short a visit. The French Journal just posted a great story on another July 4 event in France, which I would be remiss not to include in this year's round-up. A group called "France Will Never Forget" spelled out "Thank You America" in a human chain on Omaha Beach, to thank American GIs from both World Wars for their efforts in saving France. I was pleased to hear about it, not only for the French-American friendship that seems to be getting mended at every turn, but also because I've always loved the idea of saying thank you in a human chain. I'm glad theirs was such a success. Wish I'd been there! Parisians are chomping at the bait to see the opening of Pixar's Ratatouille in cinemas on August 1. 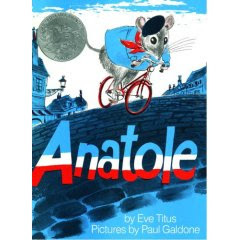 Of course, Remy, the endearing hero of Ratatouille, isn't the first adorable rat to become popularized in contemporary culture. Remember dear Ratty and Mole in The Wind in the Willows? It demonstrates that anthropomorphizing just about any rodent will make the audience coo. Think Pépé le Pieuw, Fievel, Mickey, Rocky, and Jerry (or was it Tom?). 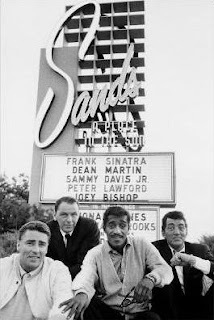 And of course, lest we forget those handsome rogues in the Rat Pack, here are the bad-boy darlings of Hollywood and Vegas, who gave the rat a decidedly hip image in the 1960s. So, of course, this got me thinking. Why did Pixar concentrate on a rat as the symbol of Paris for the film? The answer, naturally, has been there all along. Ever-wacky, my mind turned to contemplating Real Rats in Paris. Warning: Stop reading right here if you have a queasy stomach. See you at the movies August 1! A bit of rat history. It is now famously known that flea-infested rats were the sneaky culprits of the Black Death in the 14th century. In Paris the plague killed about 800 people a day, ultimately reducing the city's population by about 50%. What a difference five centuries can make. During the terrible winter of the Siege of Paris in 1871, food was in such shortage that desperate, starving citoyens killed and ate rats. Recipes for preparation of various tasty rat dishes abounded. Rat paté apparently became so popular on restaurant menus that even the price of rats skyrocketed. 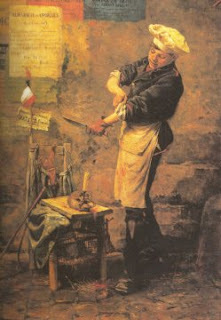 Le vendeur des rats pendant le siege de Paris, at the Musee Carnavalet. Just a year later, once the food shortage passed, carnivorous Parisians had presumably returned to consumption of more standard fare. Rats were happily repopulating Paris, notably the area around Les Halles. (All that excellent market garbage for them to feast on!) To provide Paris with a much-needed service for rat control, Maison Aurouze opened its doors on 8 rue des Halles. I am morbidly fascinated with Aurouze. One of those "only-in-Paris" curiosities, Aurouze is, er.., thriving today, still located in the same building where the fledgling family-owned store began in 1872. The house speciality is still deratisation, but they are purveyors of all manner of contraptions to help Parisians get rid of any unwanted creatures, from moths to ... bigger furry pests. The vitrine of Aurouze is unlike anything I have seen in the western world. Neat, orderly rows of mummified 80 year-old rats hanging in formation. Dusty but winsome taxidermied rats jitterbugging on the floor. Rats, rats, and more rats. 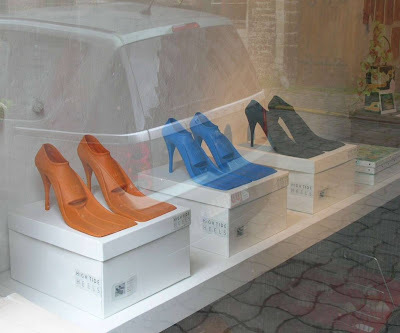 The first time I happened to pass the shop and spotted the window display, it stopped me dead in my tracks. Not as dead as those rats, of course. Rat art. Only in Paris. Exciting news in long-distance air travel. 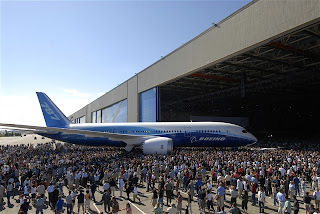 Boeing has rolled out its new, "green" 787 Dreamliner. Hallelujah! Now, barf bags, noise-cancelling headphones, and the ever-so-charming recirculation of airborne germs will eventually be history. The new jet, introduced out on the coy date July 8 (7-8-7) amid much fanfare, promises more head room, better humidity and larger windows, too. And even the toilets will flush quietly. But it will be quite a while before all flights have these 21st-century features, since airlines will be adding 787s to their existing fleets only as they need to replace worn-out behemoths. In that order, here are a few sites that have recently crossed my radar screen which are worth checking out. 3) Jet lag and in-flight comfort. Last month Parisian blogger David Lebovitz wrote a great post about Five Favorite Carry-On Items, with helpful suggestions in the reader comments, too. I, The Old-Fashioned One, seem to be in the minority in being less than thrilled about the other recent air travel news: the new regulations (just in Europe, for now) permitting cell-phone use on board flights. I mean, who cares if the plane itself is whisper-quiet, if all the passengers are yakking up a storm? I've finally done it. I've cracked Madame Tabac. It all began a year ago when I moved into my new apartment. I needed to buy more minutes of credit for my pay-as-you-go cell phone. So I crossed the street to the Bar-Tabac Jean B to make the purchase. Plowing through the smoke-filled café, I passed the men lined up at the zinc with their cafés serrés or their morning petit coup de rouge. I headed to the corner of the Tabac, where Loto tickets, cigarettes, stamps, and Hollywood chewing gum are sold and cell phone transactions take place. And there was Madame Tabac. Haggard and stone-faced, clad in a sagging grey cardigan, Madame shuffled to the cash register in her pantoufles. "Bonjour madame, I need to buy minutes for my cell phone," I chirped in well-rehearsed French. Her bulging eyelids closed into suspicious little slits. "On ne vend pas de minutes"-- we don't sell minutes. "To make my cell phone work," I continued, smiling. "Je ne comprends rien de ce que vous dites, madame," she growled, pushing back wisps of her greasy hair in frustration. "Non non, excusez-moi madame," I pleaded, "I need to buy credit for my cell phone." I nodded earnestly. "Du credit? On ne fait pas ça ici! " her snarling contempt was unrestrained. OK. I knew this Tabac store was where I could pay money to give me more time on my cell phone. I paused, slowed my thoughts. The day's first lesson in humility -- admit language failure. Deconstruct my needs into tidy little word packets. There was a small line of nicotine addicts forming behind me. Madame was getting impatient. I began anew. "Voici mon problème, madame. I have a cell phone. It is not a portable a abonnement. I have to pay money -- to be able to talk on the phone. I can pay money at a Tabac somehow so that I can buy a piece of paper that permits me to telephone on my cell phone. I do not know the word for it. Do you have what I might need?" How to be reduced to a third grader in two seconds flat. "Oh, vous voulez un recharge Mobicarte, imbécile," (actually, she did call me madame, but I know she meant imbecile. But at that point I was willing to take whatever insults came my way.) "Combien d'euros?" We finished the transaction and I scurried out, tail between my legs. As I headed back across the street, it dawned on me that this grizzly Jabba the Hutt was going to be a permanent fixture in my new life. First reaction -- dread. How could I face this grouch every time I needed a bus ticket or a Mobicarte recharge (the all-important phrase now permanently sealed in my lexicon). Next thought -- the Madame Project. I'll have to crack her, win her over to make her smile at me, if not be nice. This has been no easy task. A few days later, I returned for another Mobicarte. This time I rehearsed it to perfection. "Bonjour, Madame," I sang. "Je voudrais un recharge Mobicarte, s'il vous plait." "Euh.. oui," I said with a sly grin. "I have been très bavarde" -- a real chatterbox. "Il faut savoir se limiter, quand même, " she muttered, shaking her head. -- one should control oneself. But I did notice a supressed twitch in the corner of her mouth that, with months of therapy, could possibly have been turned into a smile. Since then, with sporadic interactions, she has tolerated my presence in her little corner shop. I have wooed her with perfect change -- lots of it. I have commiserated on the blustery weather. I have agreed with her about idiotic customers. When I could extract conversation from her, it was usually deadpan and mostly monosyllabic. I arrived in the usual grey morning haze of the Jean B, and perched in the corner was Madame Tabac, her straggly grey bun transformed into a brunette chin-length bob. "Vous vous êtes changée de coiffure, Madame!" I remarked, not knowing the response it would elicit. Suddenly she smiled, her broad yellow teeth sporting wide gaps. "I am a grandmother now," she offered proudly. "Il faut changer d'allure." "Cela vous va très bien," I complimented. "Et félicitations pour le petit enfant." With customary merci-au-revoir-bonne journée, I left, dazed that I had finally gotten across the treacherous communication divide. But that was not all. This morning I stopped in and there was Madame, new coif AND a choker of pearls and a clean navy-blue cardigan. She was looking positively radiant (for Madame). After the usual preliminaries I ventured, "And how is the petit enfant?" Madame now began to gush. "Ohhhh, qu'est-ce qu'il est mignon et adorable. Un vrai petit chéri. Qu'essss-ce qu'il est beau!" I decided to push my luck. "I'd love to see a photo some day." My new best friend, Madame said, "Oh, you'll see him soon enough here at the Jean B. He's only 10 days old so he's not here yet. Mais il grandit! He's growing. Qu'est-ce que ça pousse vite, les bébés. Yes, you'll have to come back to see him." Me and Madame. Joined at the hip. While le 14 juillet is being feverishly planned in all parts of France, and the Place de la Concorde is a beehive of construction for the annual Bastille Day parade in Paris, don't forget that many cities in America toast the day as well. Le Journal Francais d'Amerique publishes (in French) this preliminary listing of festive French activities in the U.S. in the upcoming week. Let's hope that when the buy-out of Hilton Hotels by the Blackstone Group goes through, they'll change the name. "Paris Pierre-Noire" has a nice ring to it. Anything to spare the association with the Other Paris. One of the current "must see" exhibits in Paris, before it ends on the 29th, is the René Lalique exposition at the Musée du Luxembourg, featuring the master jeweler-glassmaker's best bijoux. However, you can have access to a more permanent view of Lalique's oeuvre any day of the year, in the 8e arrondissement. At 40 Cours Albert 1er this Art Nouveau building with a facade designed by Lalique is one that even many long-time Paris residents don't know much about. Unless you are walking to the nearby Embassies of the Congo or Brazil, you just might miss it. In 1902 Rene Lalique married his second wife and designed this hotel particulier for his young family. He used it as a residence, a studio, and an exhibit space. Architects Louis-Eugene and Albert Feine designed the structure, but the decoration is pure Lalique. The pine motif begins in the thick glass panes in the wrought-iron door with bas-relief cones and branches. The sculptural detail continues from the door and seems to twine organically up the building's surface. I was fortunate to be invited inside to see the handsome Lalique chandelier which anchors the central hall. Hmm, maybe they should change those light bulbs. The mansion today serves as a private apartment building, its interior not open to the public. But just a peek at this Lalique architectural gem is worth a quick detour from the metro stop Alma-Marceau, just a block away. The capstone of this July Fourth Paris season for me was a red-white-and-blue gathering sponsored by AARO, the Association of Americans Resident Overseas. All current or future American expatriates, whether in Paris or in some remote corner of the planet, should familiarize themselves with this organization, and join it. Because AARO is an advocacy group for the 4-5 million Americans residing worldwide outside the borders of the United States. Astonished by that figure? So was I. But listen, my friends. AARO attends to the nuts and bolts of what it means to be a U.S. citizen abroad. Taxes? Voting? Health Care? Driver's License? Representation? If you think those issues don't matter to you because you're living the life in a fabulous foreign country, think again. AARO is a watchdog group that meets at least annually with YOUR representatives in Washington to advocate for your continued rights as an otherwise "out-of-sight-out-of mind" U.S. citizen living abroad. They keep their members informed about issues that affect them directly. Non-partisan, intelligent, clear information. Plus access to reasonable expat health care plan. Need I say more? Besides, they throw a really great party, too. We do live in Paris, after all.